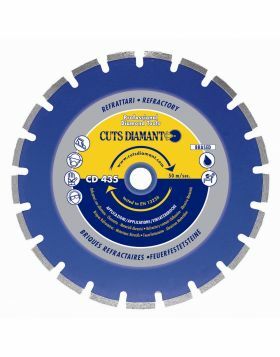 Diamond cutting blade CD 441 with sandwich silent core for cutting refractory materials. This cutting disc is laser welded with 10mm high segments and is available from Ø300 to Ø400mm for wet cutting. Recommended for cutting: refractory with high density of alumina, chamotte, kachelofen and abrasive materials. To be used on table saws.